When it comes to successful projects, choosing the right contractor for the job is an important first step. Whatever the project, slow down and do some research. If you don't choose the right contractor, you could end up disappointed in the work, feeling swindled, and needing someone else to finish the job. Get a referral from someone you know. 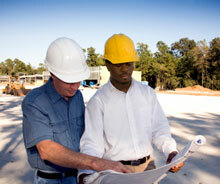 Hire a contractor who specializes in the type of work you need done. You want to ensure he or she is a specialist, you do not want a "jack-of-all-trades" – master of none! Before you even start calling the contractors, check with the Better Business Bureau to find out if complaints have ever been filed or are outstanding against the contractor. See if there are any unresolved complaints with a given contractor. Choose one that has no record of complaints or one where the complaint was resolved to the consumer's satisfaction. Be aware that a new contractor or one that changed his legal name to dodge complaints may not have any record of complaints with the BBB, so it is important to follow all of these steps. When checking with the Better Business Bureau, another important factor to keep in mind is whether or not the business is local in your market. If a business has a local office, but is regionally or nationally owned, there is the possibility that the local office has a good, clean record with the BBB, but the regional or national office does not. In addition, a local office will be able to respond quickly to a problem or issue. Check financial stability. If the contractor is unable to pay for materials, labor, and overhead costs, the job could go unfinished. In addition, find out how long the contractor has been in business? Make sure you are choosing a contractor that has been in business in your local market for many years. Ask the tradesman for copies of Worker's Compensation status and Liability Insurance certificate. A reputable contractor will have no problem providing copies of these documents. At a minimum, contractors should have Workman's Compensation, general liability (including property and personal liability), and automobile insurance. These policies help protect you and your property from potential legal problems should an accident occur. Do not be timid to ask for it. It is the only sure proof of insurance no matter what is written on the truck! Get at least three references for your contractor for locally completed jobs the contractor has done that are similar to yours and call them. The contractor will likely give you references who had positive experiences, so be sure to ask them specific questions about workmanship that are important to you. See how satisfied the customers were with the job. You might be concerned about whether the contractor cleaned up his work area and kept to his time line or whether the final invoice matched the estimate. Use references to check the contractor's current and past work history. If there were complaints about the job, or the contractor was unable to give any references, consider using a different contractor. Request a written estimate. Any contractor who does not provide you with a written estimate should be crossed off your list immediately. Don't base your decision on price alone. Be cautious of an extremely low bid. If receiving more than one estimate be sure to give the job details the same way to each contractor so you won't be comparing "apples and oranges". Read the contract carefully. The contract should clearly spell out all the steps the contractor will take from beginning to end of your job, what supplies are included, the payment schedule and the time line for the project. Ask questions about anything you don't understand, and don't be shy about asking for changes to the contract. You are the customer. Note any follow-up or guarantees or warranties the contract provides. Ensure that the warranty is a part of the contract and don’t accept that the warranty will follow. Also ensure that the warranty transfers to future owners at NO additional cost! Once you are satisfied with the contract sign it and give it to the contractor. Bix Basement Systems is a basement and foundation contractor that will assist you with your basements, crawl spaces and more. We are happy to provide you with information to any of the requests above. Contact us today for a free inspection and estimate.